Welcome to edition 124 of Insider Weekends. Insider buying increased with insiders purchasing $29.51 million of their stock last week compared to $24.21 million in the week prior. Selling more than quadrupled with insiders selling $2.04 billion of stock last week compared to $474.05 million in the week prior. This jump in selling was driven by a $1.34 billion sale of Kinder Morgan (KMI) by a director of the company on behalf of Goldman Sachs in a secondary offering. Sell/Buy Ratio: The insider Sell/Buy ratio is calculated by dividing the total insider sales in a given week by total insider purchases that week. The adjusted ratio for last week increased to 69.15. In other words, insiders sold more than 69 times as much stock as they purchased. 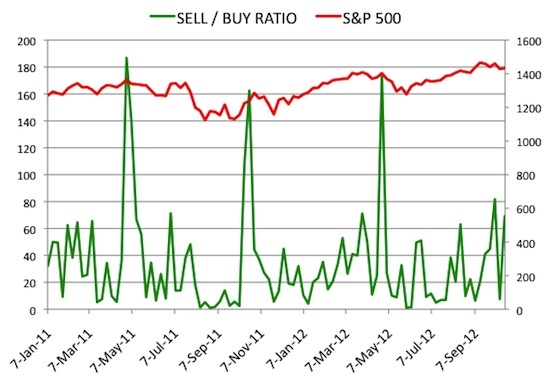 The Sell/Buy ratio this week compares unfavorably with the prior week, when the ratio stood at 19.58. Excluding the Goldman sale of KMI, the ratio would have been 23.81. We are calculating an adjusted ratio by removing transactions by funds and companies and trying as best as possible only to retain information about insiders and 10% owners who are not funds or companies. 10% Owner Sardar Biglari acquired 34,000 shares of this restaurant chain, paying $12.18 per share for a total amount of $2.3 million. These shares were purchased indirectly by Biglari Holdings Inc.
We normally exclude purchases by 10% owners but decided to include this one to highlight Mr. Biglari’s purchase. Cracker Barrel was the subject of one of our weekly focus articles. You can view the list of recent insider transactions for Cracker Barrel Old Country Store, Inc. here. Chairman of the Board Harold C. Simmons acquired 32,000 shares of this chemicals and toxic waste management company, paying $12.10 per share for a total amount of $387,250. Mr. Simmons increased his stake by 1.98% to 1,645,853 shares with this purchase. You can view the list of recent insider transactions for Valhi, Inc. here. Director Stephen W. Sanger acquired 10,000 shares of this bank, paying $33.96 per share for a total amount of $339,600. These shares were purchased indirectly through a trust. You can view the list of recent insider transactions for Wells Fargo &amp; Company here. Director James Bruce Nicholson acquired 6,000 shares, paying $17.06 per share for a total amount of $102,360. Mr. Nicholson increased his stake by 15.81% to 43,959 shares with this purchase. Pres. of National Commercial Banking Bruce R. Hague acquired 4,000 shares, paying $15.75 per share for a total amount of $63,000. Mr. Hague increased his stake by 2.74% to 149,743 shares with this purchase. You can view the list of recent insider transactions for Privatebancorp Inc. here. Senior Vice President, Sales Patrick Timothy Collins acquired 60,000 shares of this K-12 education products company, paying $2.07 per share for a total amount of $124,206. Mr. Collins increased his stake by 218.18% to 87,500 shares with this purchase. You can view the list of recent insider transactions for School Specialty Inc. here. Director Mark Kessel sold 6,000,000 shares of this biotech company for $4.73, generating $28.4 million from the sale. These shares were sold indirectly by Symphony Capital Partners, L.P.
You can view the list of recent insider transactions for Dynavax Technologies Corporation here. CEO & Chairman Philip A. Hadley sold 102,700 shares of this information and delivery services company for $93.79, generating $9.6 million from the sale. You can view the list of recent insider transactions for FactSet Research Systems Inc. here. Director Michael A. Woodhouse sold 113,371 shares of this restaurant chain for $66.93, generating $7.6 million from the sale. Director Robert A. Kierlin sold 100,000 shares for $45.26, generating $4.5 million from the sale. Executive Vice President Steven A. Rucinski sold 25,000 shares for $45.10, generating $1.1 million from the sale. These shares were sold as a result of exercising options immediately prior to the sale. You can view the list of recent insider transactions for Fastenal Company here. Director Reese J. Lanier Sr. sold 85,100 shares for $54.88, generating $4.7 million from the sale. Director Helen Ballard Weeks sold 4,480 shares for $54.43, generating $243,839 from the sale. You can view the list of recent insider transactions for Oxford Industries Inc. here.